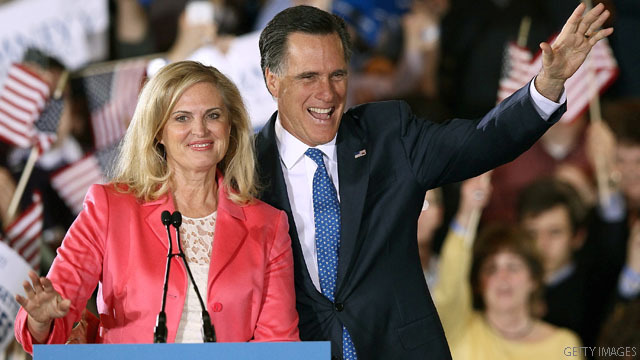 (CNN) – Republican presidential candidate Mitt Romney and his wife Ann Romney weighed in on the emotional side of politics as well as their faith in an interview published online Friday. While admitting to the occasional display of emotion, Romney told PARADE that "I don't show it quite as clearly as John Boehner," invoking the House speaker, known for a tendency to be moved to the point of tears during powerful moments. Romney, who rarely mentions his faith on the campaign trail, talked lightheartedly about the religious practice of tithing, specifically the Mormon practice of giving 10 percent of one's income to the church. Ann Romney said that she loves tithing and when they give the check, she cries. Romney joked that he cries too-but for a different reason. "I think you'll find that conservatives are more generous philanthropically than people who are not conservative," said Romney. "People who are in favor of small government are very much in favor of personal action to help other people in need." The Republican couple said they see their party as "United" following next week's Republican Convention in Tampa, Florida. Romney will be officially entered into nomination at the convention beginning on Monday through a roll call vote of the convention's delegates. Ann Romney said, if her husband were to become president, her focus as first lady would be working with at-risk youth. Similar to Michelle Obama, Ann Romney has been a highly visible and popular surrogate for her husband on the campaign trail. Asked to paint a picture of the White House under a Romney administration, the presumptive GOP nominee said that it would be a welcoming place with tours and concerts of all different music genres and, yes–there would be a horse. "Well, probably not at the White House itself, but nearby so she could go for her therapy," said Romney of his would-be White House therapy horse. Ann Romney was diagnosed with multiple sclerosis in 1998 and has said she uses riding as a form of therapy. "Romney on political emotions, "
Robots don't have emotions. Neither do puppets. He so desperately wants to be a real boy.